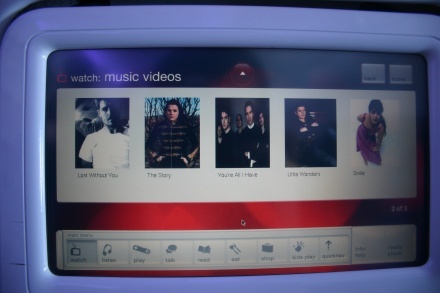 We weren't just talking with Sir Richard and crashing the first class cabin on yesterday's Virgin America flight, we also spent some quality time with the in-flight RED entertainment system. 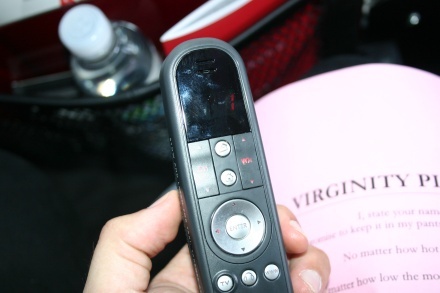 The experience shows a lot of promise, and offers up a hefty helping of media, interaction and convenience, easily besting other seat back offerings we've played with. 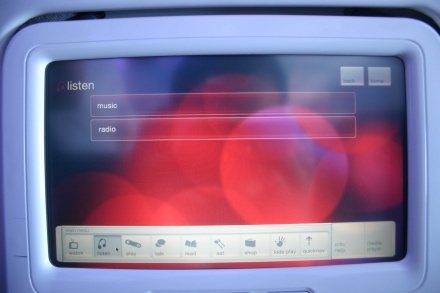 There are also plenty of rough edges and features yet to be enabled, so we look forward to playing with RED in a year or so, once everything's up and running. Our in-depth impressions are after the break. Let's start from the start. 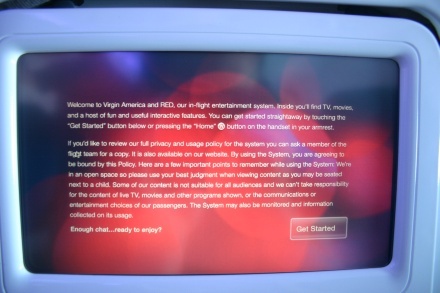 Once you tap the main screen, you're prompted with this usage policy. 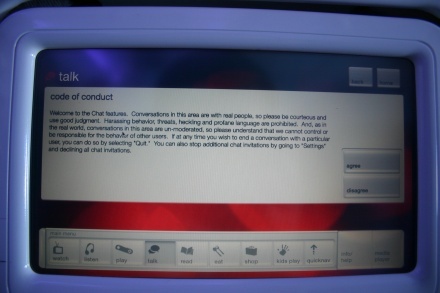 Nothing outlandish, but a reminder that you'll be bumping into fellow passengers in chat rooms, and your neighbors can see what you're playing on your screen, so use discretion. 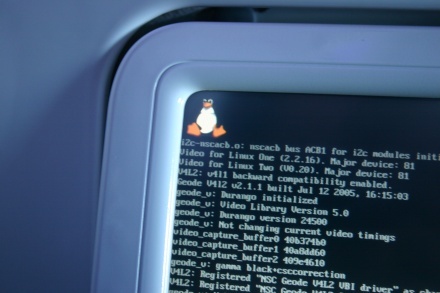 In case you're not familiar with the hardware behind this system, you might want to check out our previous hands-on with the plane, where we get more involved with the behind the curtains stuff. 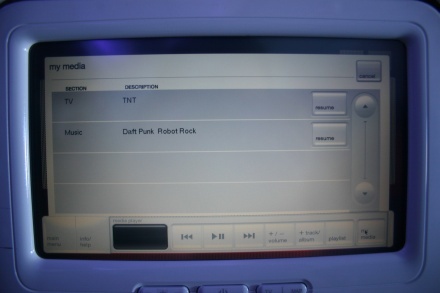 In a nutshell, every seat back has its own little Linux computer, built by Panasonic, running on an AMD Geo processor. 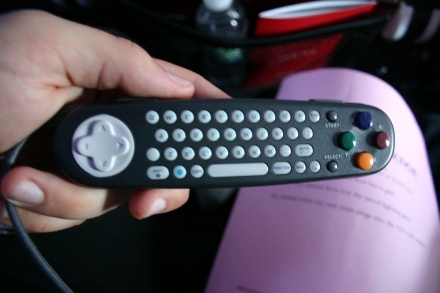 You can use the touchscreen or a USB remote / gamepad / keyboard to control the system, and media is served up off of one of three on-board file servers, along with the satellite TV decoders for live TV. 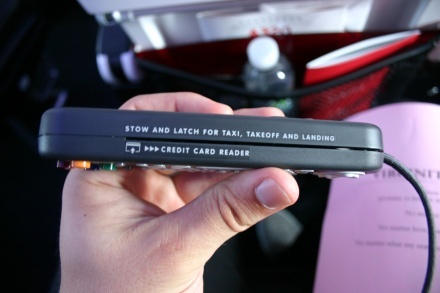 In-flight transactions are routed through a Sprint connection with the ground, and credit card data is stored in flash memory for the flight. 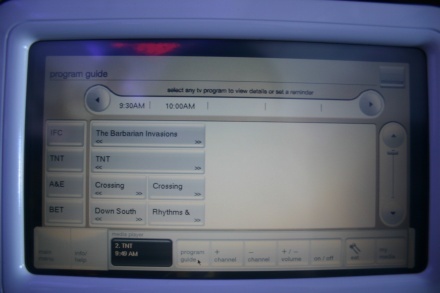 One of the basic functions the system serves is as an interactive in-flight trip tracker. 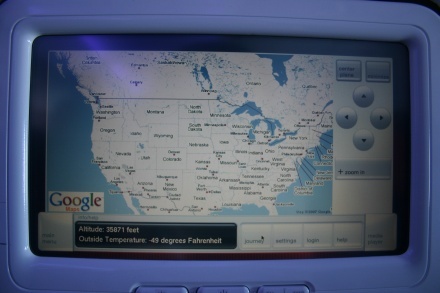 RED has Google's map tiles stored on-board. 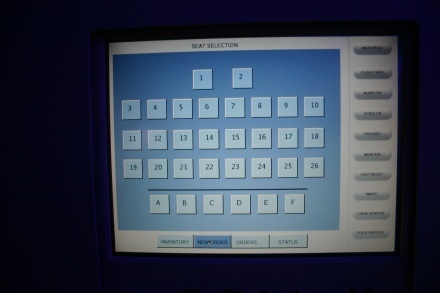 If you get confused by the system, which is pretty unlikely, you can pop open this handy user's guide. 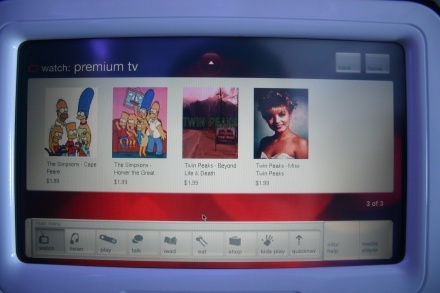 It would hardly be a 21st century airplane without in-flight movies, and RED has plenty of that. 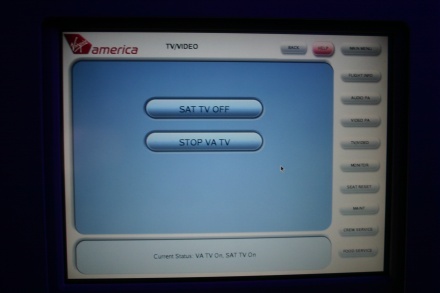 The options are pretty straight forward: "Movies" takes you to pay-per-view moves stored on the plane, "Music Videos" has a selection of free vids, "TV" plays live Dish Network TV, "Premium TV" allows you to purchase TV shows for a couple bucks a pop, and multi-lingual TV gives you access to free foreign TV shows. 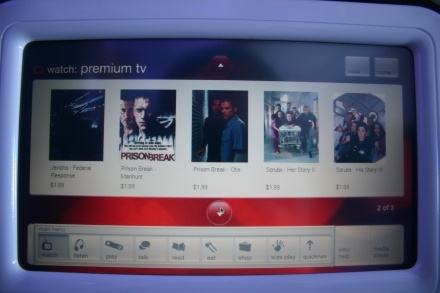 Seven rows of five movies each adds up to around 35 titles so far for your viewing pleasure. Newer titles go for $8, while classics run at $6. 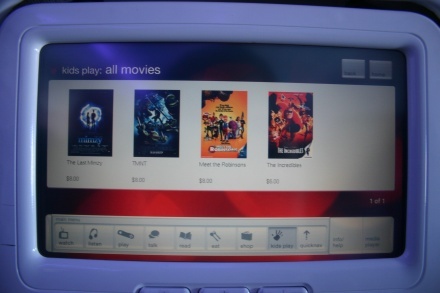 Purchasing a movie is a breeze, you just tap the title to view a description, tap a purchase button if you're ready to go all the way, and then swipe your card below the screen to pay up. 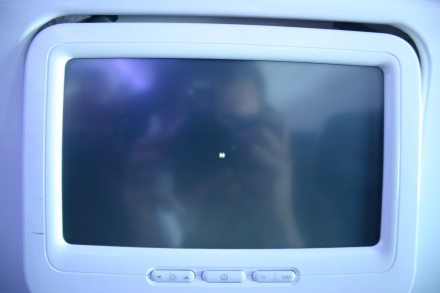 Quality certainly isn't near HD, which is disappointing given the 1024 x 600 display resolution, but it's passable. There weren't really any load times to speak of, which is nice for something streaming off of a server, but the playback controls were pretty rough: fast forward and rewind only serve to jump you back a certain chunk of seconds at a time, so skimming through the first 10 minutes of Die Hard, which we had accidentally restarted, was a painful process. The snazziest part is the picture-in-picture mode for when you're ordering food, which we seem to have misplaced our photo of. 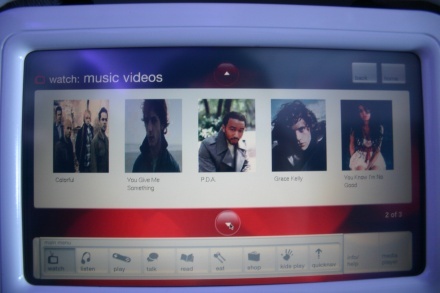 Music video selection skews decidedly towards pop, but hopefully Virgin will be adding more selections in the near future. 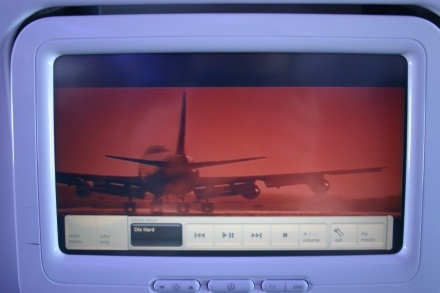 The satellite TV program guide is nice, if lacking in comprehensiveness, but the crappy video quality and occasionally video drops are quite on par with other airline offerings. 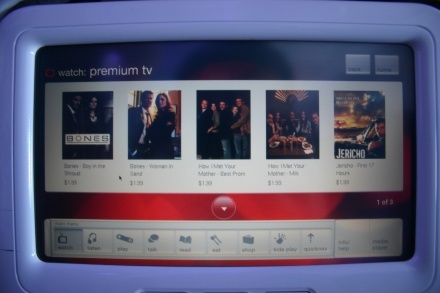 Premium TV could certainly use some more selections, but price is acceptable and we're closet Jericho junkies, so it's all good. 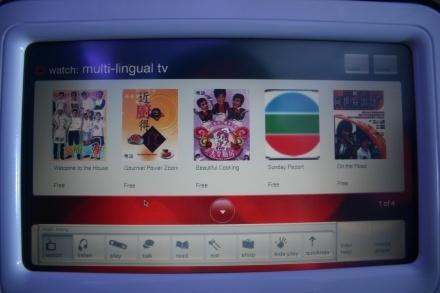 Multi-lingual TV is, well, multi-lingual. We hear that whole "foreign language" thing plays well with the international types. 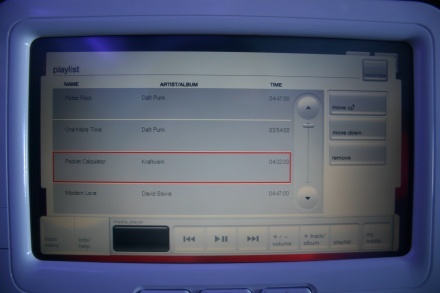 Yeah, the initial music menu certainly looks bare, but there's good stuff underneath. 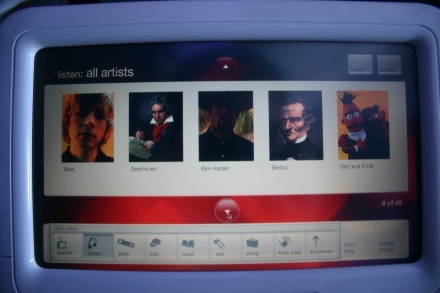 We hit the "All Artists" button, which turned out to be a mistake. 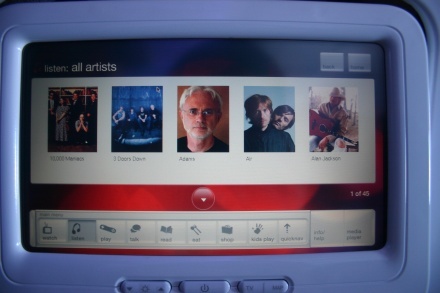 There are hundreds of artists, and while the interface is decently responsive, it still took us over a minute to make it to the D section, where we gave up. Luckily the first four letters of the alphabet include artists like Bert and Ernie, Daft Punk and David Bowie, so it really wasn't a huge deal. 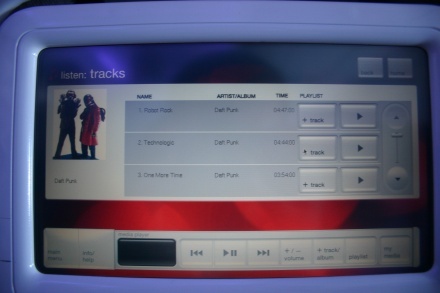 Once you tap an artist, you get a selection of their tracks which you can either play right there or add to your playlist. 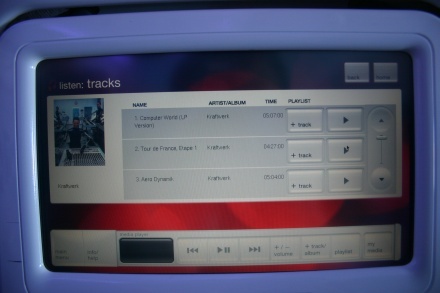 The scroll bar is a little wonky, but overall it wasn't too hard to build up a decent collection of tracks. The playlist editor is quite functional for re-ordering and removing tracks. When the bottom menubar is in "Media Player" mode, you get this "My Media" option to let you switch between different media you've been playing. We're not really into the randomness of radio, but there's a decent collection of stations for most tastes if that's more your style. 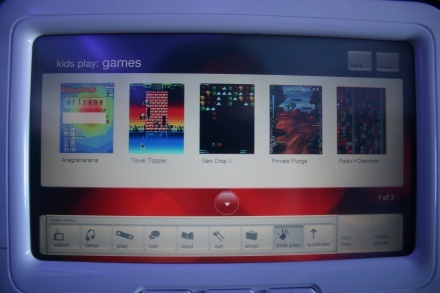 Other than Doom, we didn't really spend much time with these open source knockoff games, we guess we'll just have to save that for our next cross continent Virgin America flight. They don't look horrible, just uninspired. 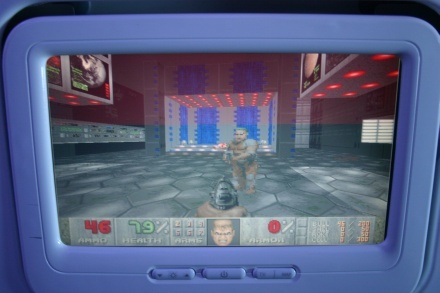 Luckily, Doom is the real deal. Turns out it's a bit difficult to shoot back while you're taking pictures. 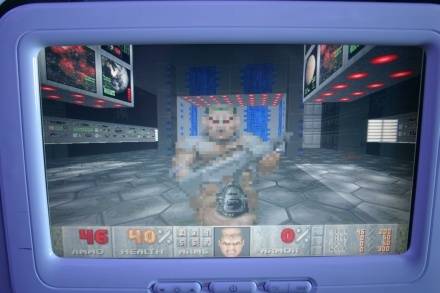 Overall, Doom's a blast. 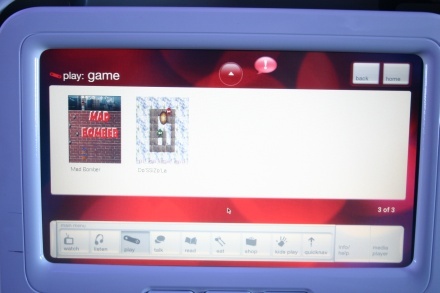 The controls are a little loose at the moment, the framerate stutters just a bit, and we didn't find the gamepad completely comfortable to use for such shooting purposes, but it still feels like a monumental achievement to get this kind of game built into an airplane, and it's certainly playable. 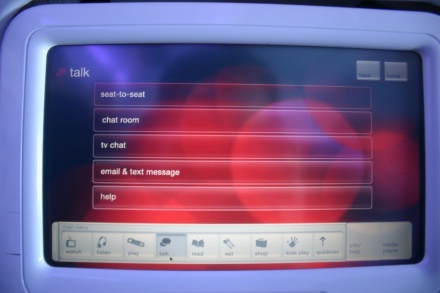 We could easily see Talk becoming one of our favorite in-flight features. 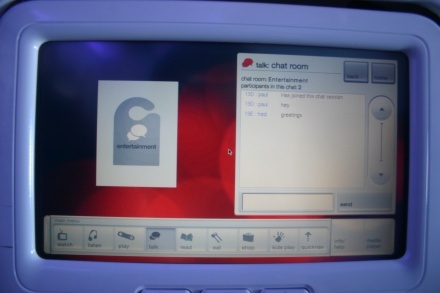 Currently the Email & Text Message option is disabled, since there's no internet on the plane yet -- you'll have to wait until next year -- but the rest of the chat functions worked just great. 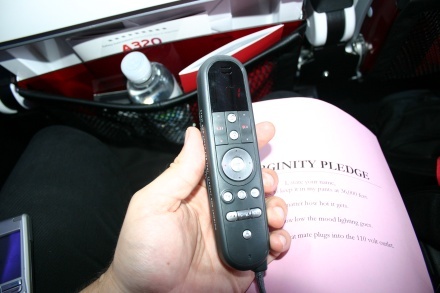 Flight attendants have mod privileges, but you've got to pretty much expect an anything goes scenario. 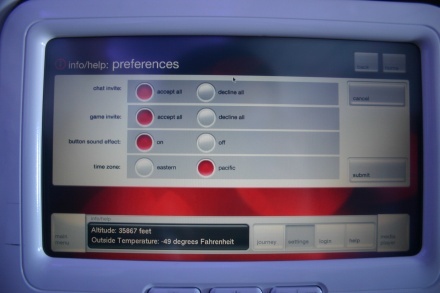 If that's not your style, you can set preferences to reject chat invitations and keep to yourself. 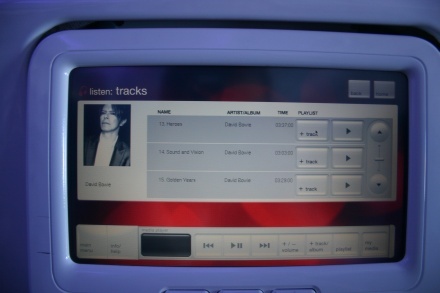 We chose "paul" for a screenname, being the creative passengers we are. 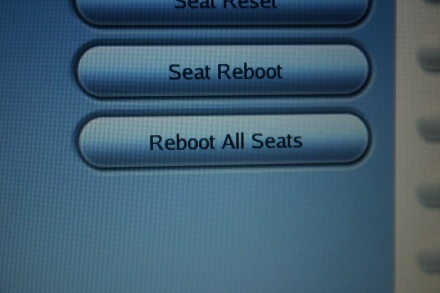 Nobody was in the chat room, so we created a "fred" user for the seat next to us. 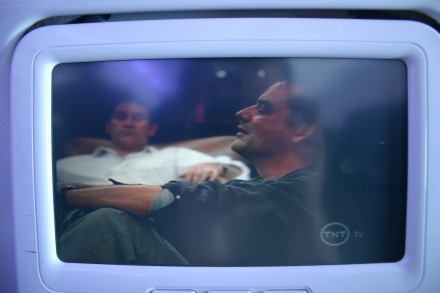 Fred and Paul chilled out in the TV Chat room, watching ESPN. Neither of 'em had anything to say about Barry Bonds. 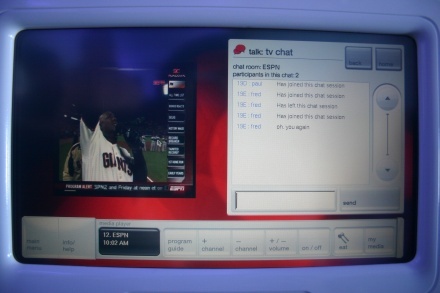 We're pretty stoked about TV chat, and it works as advertised, but the drawback to all of these chat features is that your enjoyment is contingent on other passengers using them as well. Like we said, Email & Text Messaging is currently disabled. 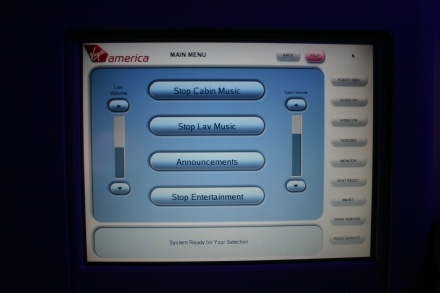 Once this option is available you'll be able to buy and read ebooks in-flight, and we think certain news sources will be available as well. 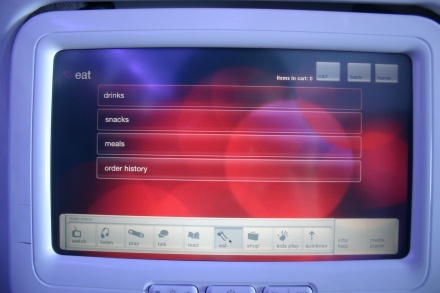 The Eat menu was really a breeze to use. 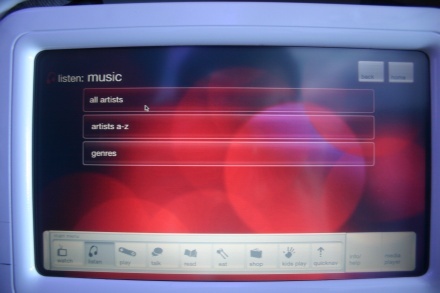 Just select the category, select what you want, pay and enjoy! 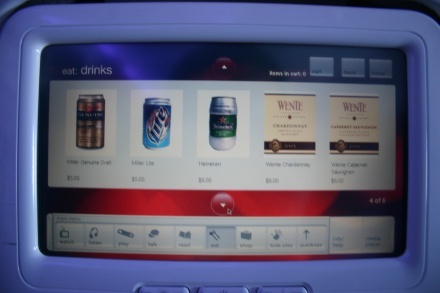 We chose drinks. 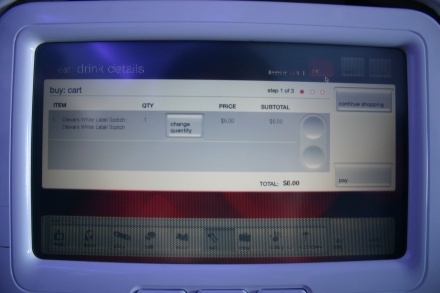 Soft drinks and water are free, adult beverages will cost you. 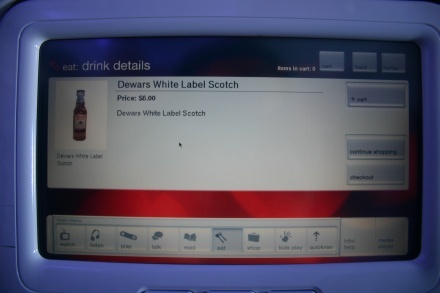 We chose the Scotch. After you tap the add to cart button, you can either continue shopping or go straight to checkout. 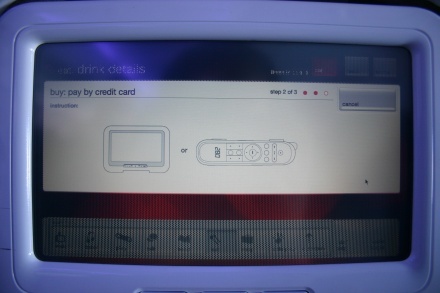 You just tap pay, and then swipe your credit card below the screen or through the USB controller. And now it's on the way. Theoretically. 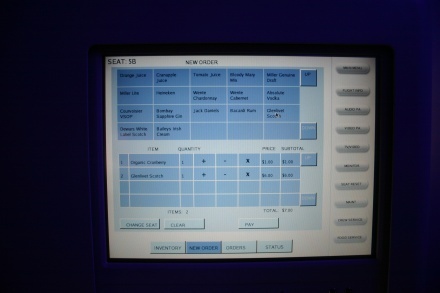 For the inaugural flight the attendants weren't fulfilling purchases, since people were just messing around with the system, and credit cards weren't being charged for media or snack purchases. 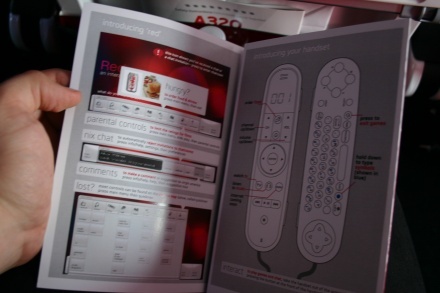 Another menu option that's not ready for prime time yet, but apparently you'll have a Sky Mall-esque catalog to order from, and orders will be "pushed" to the ground while in flight. 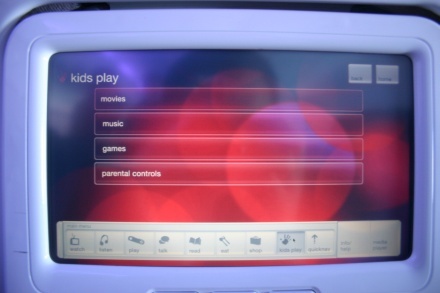 This menu collects all the various child-friendly content on RED into screen. 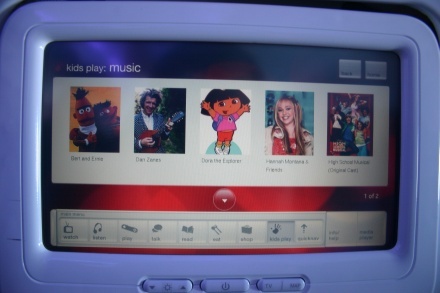 You can limit the movie selection of your kid, but once you set it you'll have to ask a flight attendant to remove the restriction if you change your mind. 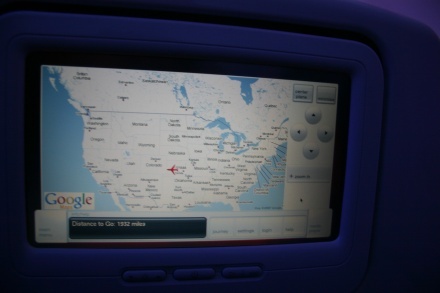 Quicknav simply allows you to see all the various menu option in one screen. 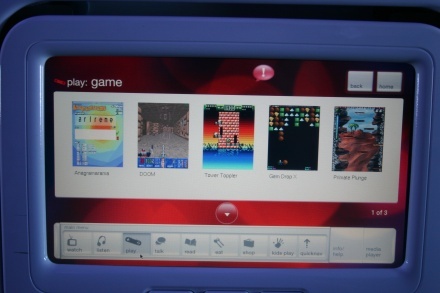 Pretty convenient, but it's not like the menus are hard to get around anyways. 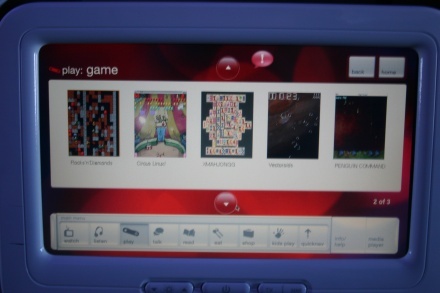 Yeah, that game invite option? 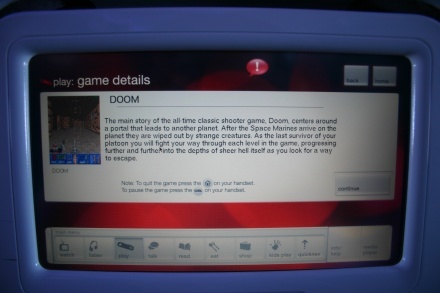 Doom multiplayer is on the way. 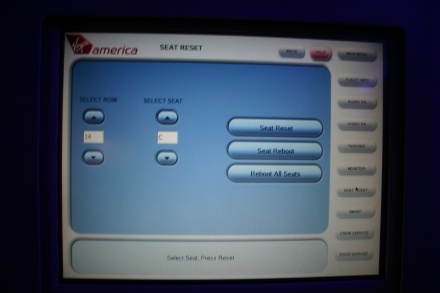 Otherwise the options are limited, but there's really not much to set. 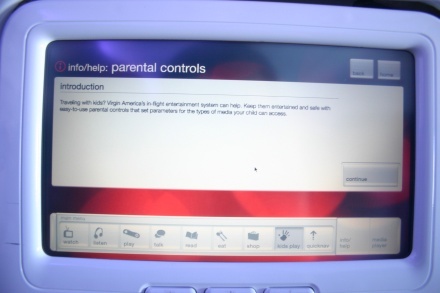 If you want to set screen brightness the control is below the screen. 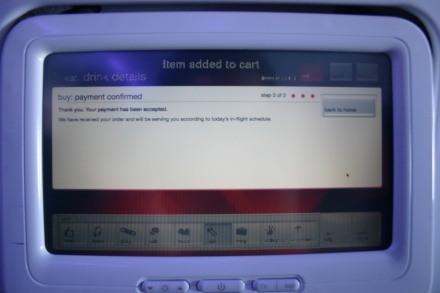 We tapped the "Login" button, which is currently disabled, and managed to crash the system. 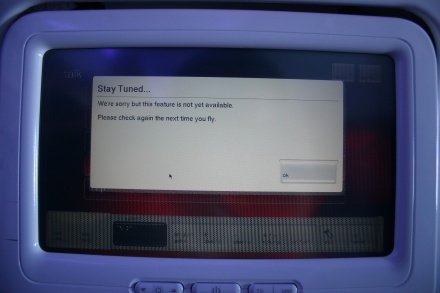 We tried to reproduce the error, but weren't able to. 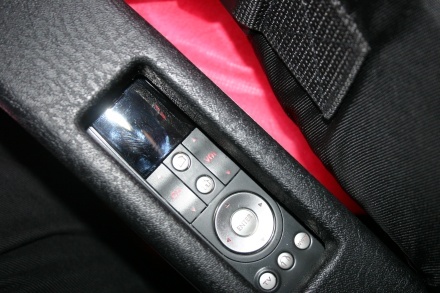 The USB remote / keyboard / credit card reader / handset is built into your seat's armrest. 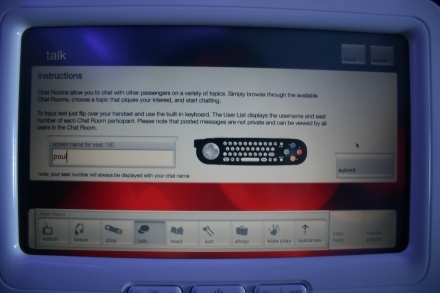 You can flip the remote over and be faced with a full QWERTY keyboard and gamepad, for enjoying the further features of RED. 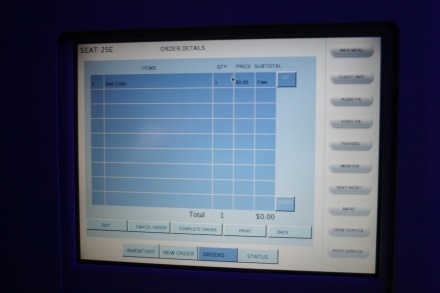 You won't normally see this on your flight, but this is what the flight attendants are faced with when you make an order. 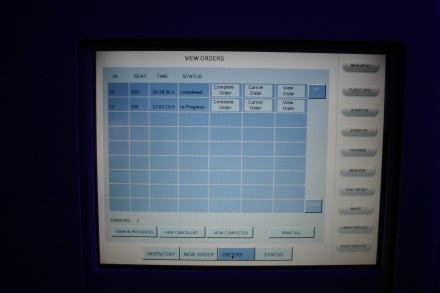 They can also enter, revise and cancel orders from this screen. 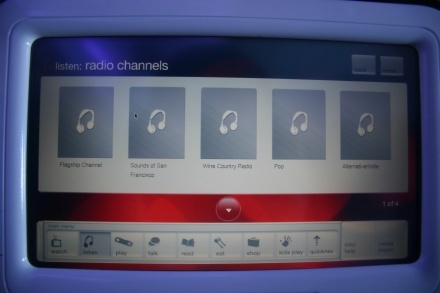 There are also controls for the rest of the entertainment options in the cabin. Be nice to your attendants, they have the power to reset! 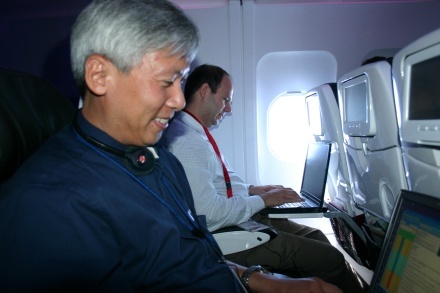 For the inaugural flight we had tech support on board to troubleshoot problems and monitor system load -- everything went smoothly for the most part. 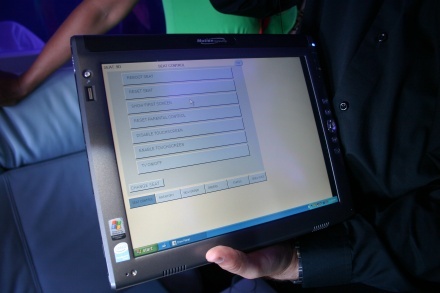 Flight attendants are also equipped with this wireless tablet for taking orders from passengers that don't want do their own ordering from RED. 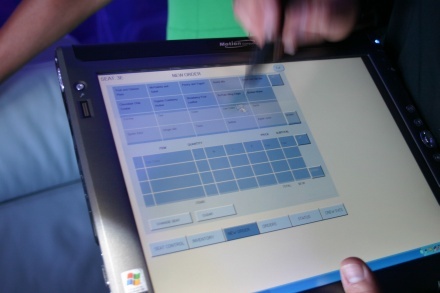 The tablet is pretty much a mirror of the one we saw in the back of the plane, so system reset functions are also available for the attendant on the go. That's it, thanks for reading this far. 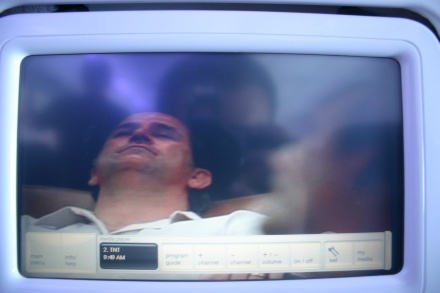 Before we sign off, above is hands down our favorite feature on this airplane: USB charging plug and a real, live AC plug. 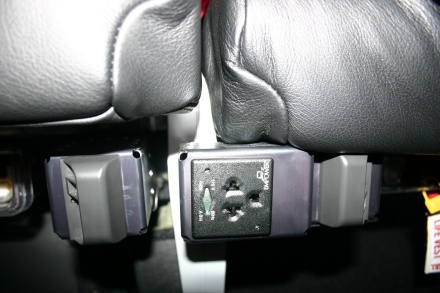 There's really no reasonable excuse for current airlines not to have standard power plugs, and once you go AC it's hard to go back.